I’ve been doing a lot of sock knitting while watching the Stanley Cup Playoffs. I have four different socks going, three of which are in Trekking XXL, which is one of my favorite sock yarns. Socks make for good hockey knitting. The most progress has been made on my Trekking 2 x 2 Ribbed Socks. Sock #1 is completed. Using 2.25mm/US#1 dpns, which are giving me a gauge of 9 stitches per inch, I cast on 80 stitches and started knitting away in 2 x 2 rib. When using a yarn as busy as this one, a simple design is best, and it doesn’t get much simpler than 2 x 2 ribbing. I made the cuff 7 inches long. I decided to work a short-row heel because a gusset would mess up the striping. And because I wanted to keep the flow of the striping from the leg to the instep, I started the short-row heel with a new working yarn. I work short-row heels over approximately 60% of the stitches. I wanted to keep the instep stitches balanced, so I knitted the heel on 46 stitches, leaving 34 stitches on the instep needle. The instep pattern begins and ends with Purl 2, which keeps it all nice and symmetrical. After getting the stitches all situated, I dropped the working yarn and started working the heel stitches from the opposite end of the ball. I didn’t cut the main working yarn because I knew that when the heel was finished, I would break the “new” working yarn and the original working yarn would be sitting right there patiently waiting to continue going round and round, keeping the stripes intact. When I work short-row heels, I wrap the stitches in the usual manner, but when I knit the wrapped stitches, I leave the wraps along. This creates a very nice line of tiny, decorative eyelets that for my money give the best looking short-row heel ever. It also has the advantage of not requiring the knitter to pick up and knit wraps. In my opinion, that’s a big plus. 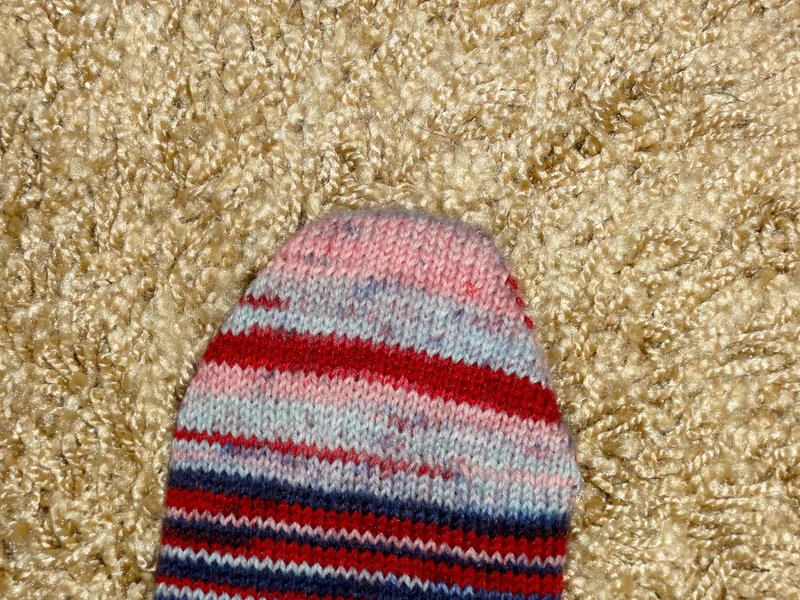 So, after knitting and knitting and knitting some more, the foot of my sock measured 8 inches, so it was time to do the toe. Yeah, I have big feet. They are 10 inches long. There are many options for toes, and normally I chose a nice round toe because it just fits me better than a wedge toe. 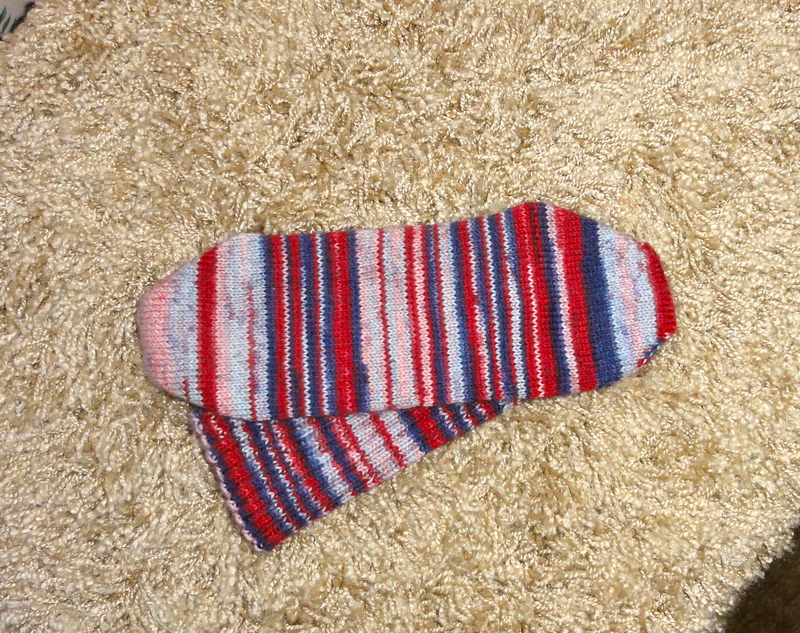 But for these socks, I decided to knit a short-row toe that is nearly identical to the heel. Although the heel and toe look virtually identical, there are a few differences. First of all, I just continued using the original working yarn to knit the toe. Also, the toe was worked on 50% of the stitches, not 60%. It’s knitted on the instep stitches, then grafted to the stitches on the sole. And I left only 14 unworked stitches instead of 16 between the wrapped stitches on the heel. Yeah, that’s a lot of Kitchener (40 stitches grafted to 40 stitches), but I can Kitchener in my sleep or, in this case, while watching game #2 of the Western Conference final of the Stanley Cup. Can you pick out where the graft is? BTW, the Blackhawks won to take a 2-games-to-none lead over defending champs the L A Kings. Go, Hawks! 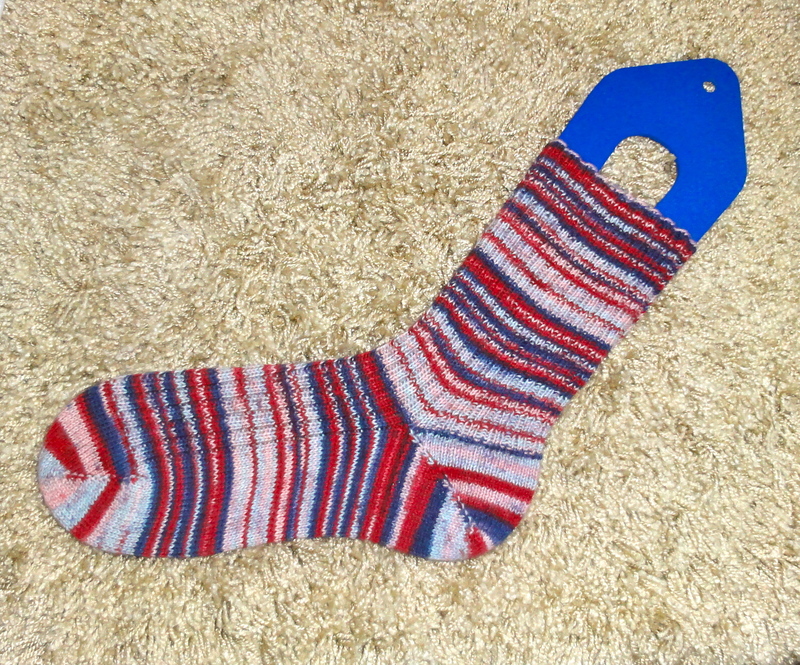 This entry was posted in Knitting, Socks and tagged hand knitted socks, Kitchener stitch, knitting and hockey, ribbed socks, short-row heels and toes, sock knitting, sock yarns, stanley cup playoffs, striped sock, style, Trekking XXL. Bookmark the permalink.